They always say each pregnancy is different. It's very true. 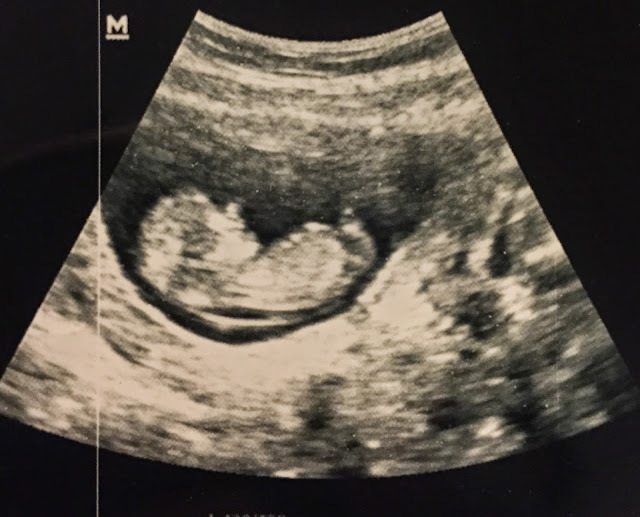 Even though this will my third baby, it's my fourth pregnancy. My first pregnancy was a short journey as I miscarried at 8 weeks. It was the most humbling experience to feel that rush of excitement then a flood of sadness in a matter of minutes. My second pregnancy I was reluctant to get excited. Then week by week went by and the pregnancy was progressing the way it should and it was a relief. I was able to enjoy the journey a little bit more. By the third pregnancy that hesitancy never left. I don't think I formally announced it until I was about 16 weeks pregnant. But I had two beautiful babies at the end of those last two pregnancies. Each journey was completely different and I can remember those 37 weeks so clearly. Yes, my girls were both born at 37 weeks to the day. This is my fourth pregnancy. Because I have had two successes in a row, I have allowed myself to get excited pretty early on. At the first doctor appointment I was able to see a little speckle on the screen. I wasn't able to hear the heart beat but I was able to see one of the ultra sound. There it was, my little baby. After every appointment I count down the days until the next appointment. I'm an anxious person to begin with and being pregnant I think I am worse. This past Friday was my second and latest appointment. Noah came with me because I was thinking we may see the baby on the U/S. The nurse was able to find the baby's heart beat right away. 160 bpm. It was the best sound. I asked the doctor if he could sneak us in for an U/S. I was way too excited not to see the baby again. The sonographer was able to sneak us in. She showed us the heart beat. The baby was wiggling around and it was the cutest. But then she kept going back to this one spot on the screen. Then she was measuring and her quiet demeanor made me worry right away. I asked her what she was looking at. Then I asked her if I should be concerned. She told me "maybe". Maybe???? Then she told me she would discuss with the doctor and he would probably want to see us in the exam room again. It was definitely not what we were expecting to hear. It automatically made me frantic and nervous. Nuchal translucency is a collection of fluid under the skin at the back of your baby's neck. It can be measured using ultrasound: between 11 weeks plus two days and 14 weeks plus one day of pregnancy. It can tell your about your baby's risk for Down Syndrome and other problems. What started as a "just for fun" picture of the baby turned into something alarming and unknown. Because we did the NT scan and found this result now our doctor wants to do further testing to eliminate any potential complications. I'm waiting for the appointment to be scheduled and we can perform the testing. I pray it's nothing and everything turns out fine, but it's no easy task for me to stay calm and not stress. It's just not in my DNA. So that's the latest. We are praying for a healthy baby and healthy pregnancy. Please keep me in your thoughts.